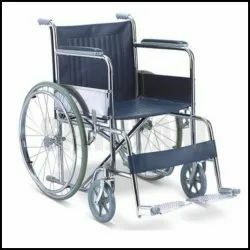 Prominent & Leading Manufacturer from Pune, we offer folding wheel chair, folding self propelled wheelchair and fixed type wheel chair. We have attained wide reputation in the market by developing best quality Folding Wheel Chair. Designed to withstand the rugged handling at hospitals, these wheelchairs are gaining huge acclamation for its space saving design. The easy to fold wheelchairs weighs 25 kg and made from a rustproof stainless steel material which eliminates the risk of contamination. Further, we are providing the robust quality wheelchair with 59 cm large wheel diameter at the best price. 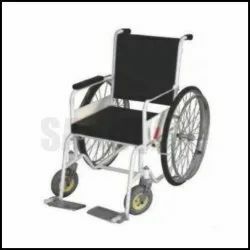 We are renowned firm developing widely demanded Folding Self Propelled Wheelchair. Hospitals and clinics with space constraints are showing trust in our offered foldable wheelchairs that can be expanded and folded back to its original size in a fraction of a minute. These chairs are designed with a 46cm x 40cm seat width and fabricated from premium grade material to ensure long-lasting performance. With the support of astute professionals, we are involved in developing best quality Wheel Chair Fixed Type. These chairs are widely known as transporters that are suitable for patients from all age groups. The spacious and highly comfortable wheelchair is designed with 45cm long backrest. Further, it is extremely lightweight and easy to move and can be ordered from us at a leading price.